Italy's Interior Minister Matteo Salvini threatened to close Rome's airports amid fears that Germany may deport groups of migrants to Italy. 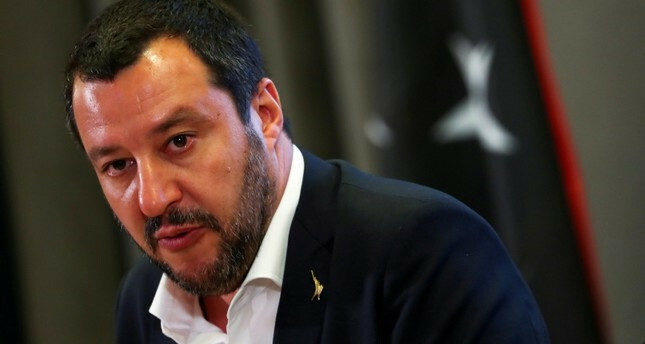 "If anyone - in Berlin or Brussels - plans to dump off dozens of migrants with non-authorized charter flights, he should know that no airport is available or will be," said Salvini Friday. "We're closing the airports, just like we've already closed the ports." Employees at Munich's airport have told dpa that authorities in the southern state of Bavaria are planning a first set of group deportations to Italy in the coming days of migrants who arrived at the German border but first registered in Italy. The sources said Bavarian police are to accompany a charter flight with the migrants onboard to Italy, which is responsible for their asylum applications according to EU rules. Italy's populist government, which was formed in June, has adopted tough anti-immigration policies after the country became a main route for sea migrants headed to Europe. Germany has for several years been a popular destination for many migrants arriving in Europe, but the issue has become a hot topic in German elections, especially in Bavaria, where regional elections are to be held next weekend. The Bavarian government has often sought stricter migration policies than the government in Berlin, including strengthening its own border police and border checks and setting up an own asylum office aimed at speeding up the deportation of rejected asylum seekers. Normally, the federal police are responsible for deportation flights from Germany, but in the past months, about two dozen Bavarian police officers have been trained for the operations. A spokesman for the Bavarian authorities responsible for asylum applications and deportations denied that there were plans for large-scale returns this week. "There isn't any charter flight this week," the spokesman said. Bavaria does finance its own flights for deportation, but these are "coordinated with federal police," he added. Bavarian police have only accompanied deportation flights in individual cases "in order to gain practical experience," he said. A deportation by charter plane to Milan was already carried out at the end of July, according to the German Interior Ministry. In the first half of the year, Germany sought to return 10,748 migrants to Italy. Most of them were being sent back according to the so-called Dublin rules, under which migrants must register asylum claims in the EU member state where they first set foot, and that country remains responsible for handling their claims. Only 1,692 foreigners were actually returned to Italy in the first half of 2018, according to the German Interior Ministry.